A Philadelphia radio station has used its annual Wing Bowl as an opportunity to release never-before-seen footage of Chris Christie falling off a chair in its studio. It is perhaps the most important artifact to be leaked in the last decade. 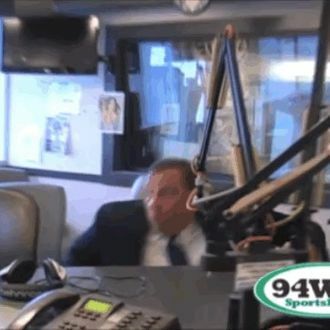 When Christie went on the 94WIP morning show in June, he promptly fell off his chair upon greeting host Angelo Cataldi. Now this moment has been immortalized in video form. Honestly, if he can’t sit in a chair, can he really run a nation?